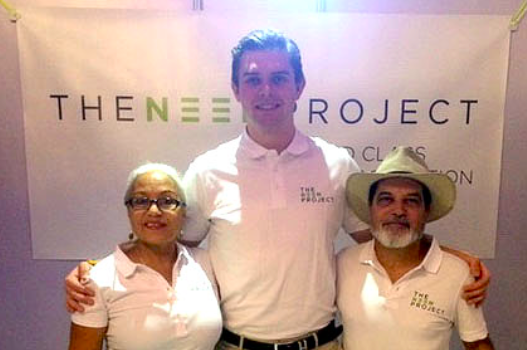 Attending the first annual “World Neem Organisation” Summit in Bangalore, India are Abaco Neem COO, Daphne de Gregory-Miaoulis (left) and CEO, Nicholas (Nick) Miaoulis (right) with Leopold Ingenohl (middle) representing Dr Martin Vorderwülebecke who sponsored their attendance to promote their joint venture – The Neem Project – located on the El Retiro Ranch in Paraguay, South America. They are committed to planting 200,000 Neem trees to satisfy anticipated bulk raw commodity market demands of neem leaf, bark and oil to be produced and shipped globally. 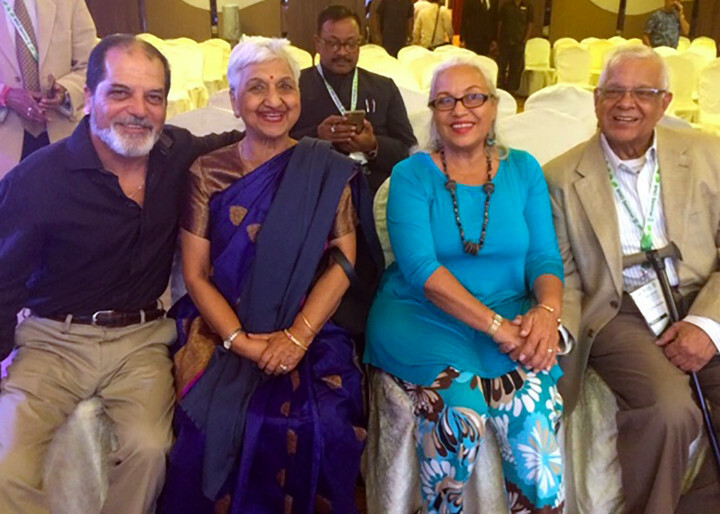 Abaco, Bahamas – The proprietors of Abaco Neem, Nick and Daphne Miaoulis recently returned from the first annual “World Neem Organisation” (WNO) Summit and educational trip to Bangalore, India which was attended by 21 companies from 7 countries outside of India. Those countries included The Bahamas, Bangladesh, Kenya, Australia, Canada, Paraguay and Portugal. The use of neem originated in India almost 5000 years ago and has been used as a popular medicinal herb as part of traditional remedies for anti-viral and anti-bacterial, along with being a powerful immuno-stimulant. The attendance and participation of the Miaoulis team at the WNO Summit and Exhibition was sponsored by Dr. Martin Vorderwülebecke, founder of their 4 year old joint venture in Paraguay, South America called The Neem Project. That farm currently has 800-acres cultivated with an excess of 20,000 neem trees originating from Abaco Neem certified organic seeds. The aim of The Neem Project Exhibit was to promote the Paraguay farm as a supplier of world class organically grown raw commodity of neem leaf, oil, bark and cake (a by-product of the neem seed). Shown in the photo from left to right are: Founder and CEO, Abaco Neem, Nicholas (Nick) Miaoulis (left) and COO, Abaco Neem, Daphne de Gregory-Miaoulis (second from right) with Dr. Ramesh Sazena, Chairman of the Neem Foundation and core-founding WNO member (right) with his wife Sulakshna (second from left) at the World Neem Organisation Summit in Bangalore, India, December 2018. Bahamian, Nicholas (Nick) Miaoulis started his farm in Abaco, The Bahamas in 1992, with seeds that originated from India: the world’s largest producer of neem. Today, the farm encompasses a 110-acre neem orchard, almost 50 variety of fruit trees and is a rich habitat for birds, bees and butterflies. There is also a quaint island style cottage for visitors, a camp site for tents and a holistic retreat program offered. Their factory and retail store based near the Marsh Harbour airport is where they produce and sell an extensive line of neem products, also available online through their website. During their 2 week Bangalore trip, the Abaco Neem CEO Nick Miaoulis and COO Daphne de Gregory-Miaoulis learned about the latest industry developments, shared their knowledge, met some of the leading researchers and producers, and showcased their neem oil. At the WNO Exhibition, they demonstrated the superior quality, colour, scent and taste of the Abaco Neem oil that is a result of their organic farming and harvesting methods. The fruits that hold the neem seed are collected from the trees and not the ground, and the cleaning and drying process of the neem fruit contributes to making their neem oil, one of the best in the world, according to many of their colleagues. The same production methods will be incorporated by The Neem Project to ensure the same high-grade, superior quality products. Dr. Joaqium Morgado, founder member, chief scientific coordinator and regional director, (Europe and Middle East), WNO is interested in the work of the Miaoulis team and plans to visit the Abaco Neem farm and factory in February 2019. For the past 25 years, Dr. Morgado has studied neem for sustainable medical applications and is close to a major breakthrough using neem as a treatment for oral and prostate cancer care. Networking at the Summit also included in-depth and personal meetings with Klaus Ferlow with whom prior contact was through email and phone. Nick Miaoulis and Klaus Ferlow are passionate about educating the public in the many uses of neem for healthcare prevention in humans and animals and for beneficial uses in agriculture. Ferlow is a renowned neem researcher and producer who has authored over 70 articles, and a leading book, “Neem-Nature’s Healing Gift To Humanity.” Together with Miaoulis, their combined knowledge of 50 years of experience has helped increase the education of neem and the medicinal benefits. 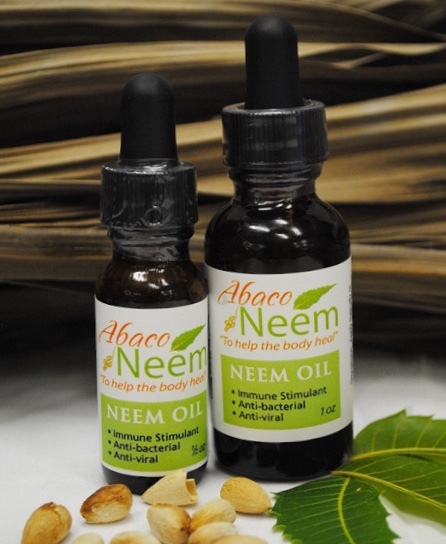 Abaco Neem is a proud Bahamian company that started in 1992 in Abaco, The Bahamas, whose philosophy is “To Help The Body Heal.” They have a 110-acre organic farm as well as a manufacturing and retail facility located in Marsh Harbour, Abaco. They pride themselves for their environmentally friendly farming practices and for contributing to the health care of The Bahamas, with great focus on 2 preventable diseases, hypertension and diabetes. Their farm grown aloe, citronella, and bees wax are also included in an assortment of neem products. Abaco Neem is working towards becoming a research center for preventative medicinal purposes and being a major part of integrated medicine of the future. Holistic retreats and educational programs as well as farm and production center visits are available. You can learn more about the company at www.abaconeem.com.